Are you applying for a new PAN card or corrections in the PAN Card details and for duplicate pan card if lost you do not have any proofs for the same, then no need to worry, this Verification Certificate is precisely for you, all you need is to download this form and fill it up and reach any gazetted officer and get it signed. For both address and identity proof there is a list of documents out of which applicant can submit any one. 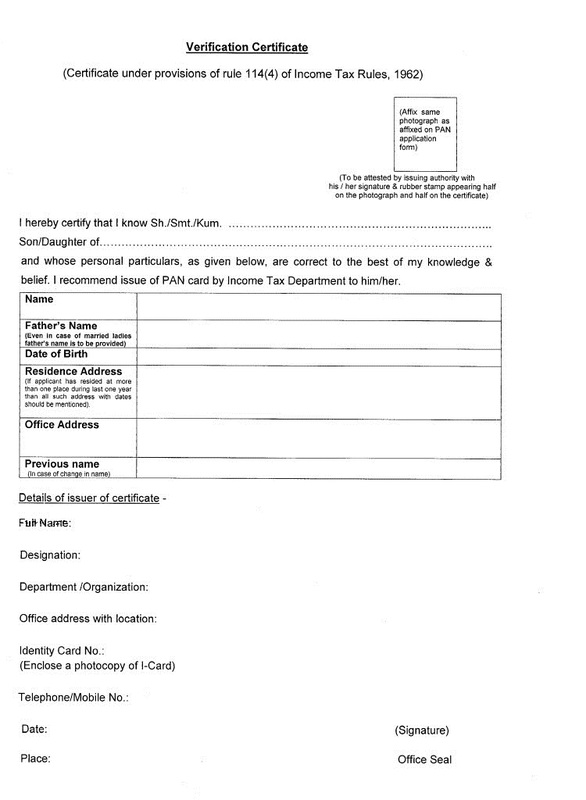 But in some cases where the applicant is not able to produce his/ her identity or address proof, Income tax department allow them to submit a Certificate of identity or address certificate signed by a Member of Parliament or Member of Legislative Assembly or Municipal Councilor or a Gazetted Officer. Once you get this certificate filed and signed by MP or MLA or Gazetted Officer then it will work as a proof of identity or proof of address for your PAN card application. This Verification Certificate comes under the provisions of Rules 114(4) of IT Rules, 1962 of PAN (Individual / HUF). Note: Kindly Attach this signed certificate and photocopy of gazetted officer's ID card along with pan application form. Click here to download the Gazetted Officer verification certificate for PAN card. PAN Card Gazetted Officer Form Format, PAN Card Gazetted Officer Form Download, new gazetted officer certificate for pan card, gazetted officer form for pan card pdf.